As promised, today I’m finally going to share the details about our Dining Room DIY Planked Wall Treatment! 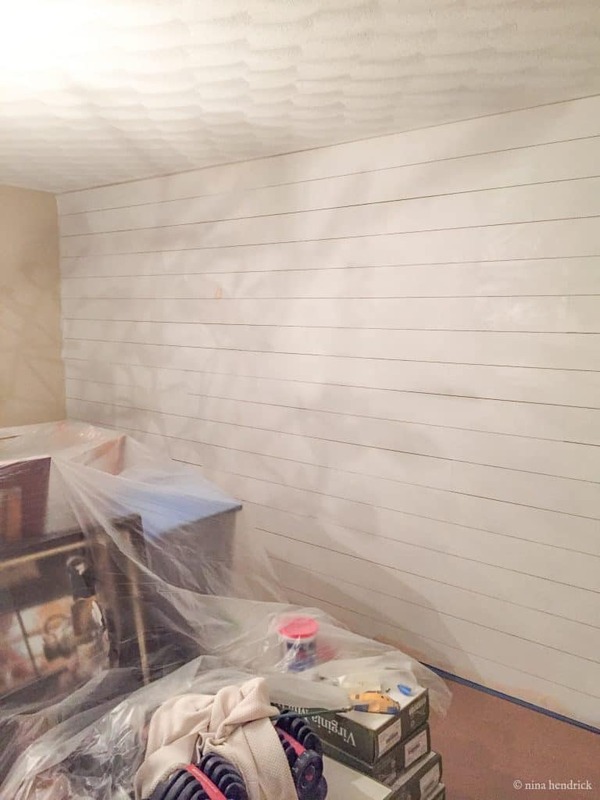 Most people who have asked questions have mentioned my “shiplap”. 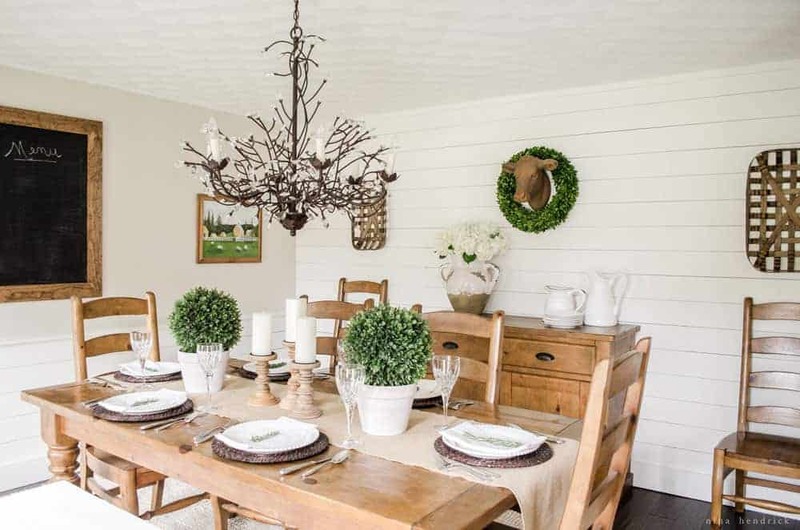 I know it’s a buzzy term right now because of Fixer Upper, but it seems like it has become a broad decor term to describe any and all planked wall treatments (I’ve even seen beadboard described as shiplap!). 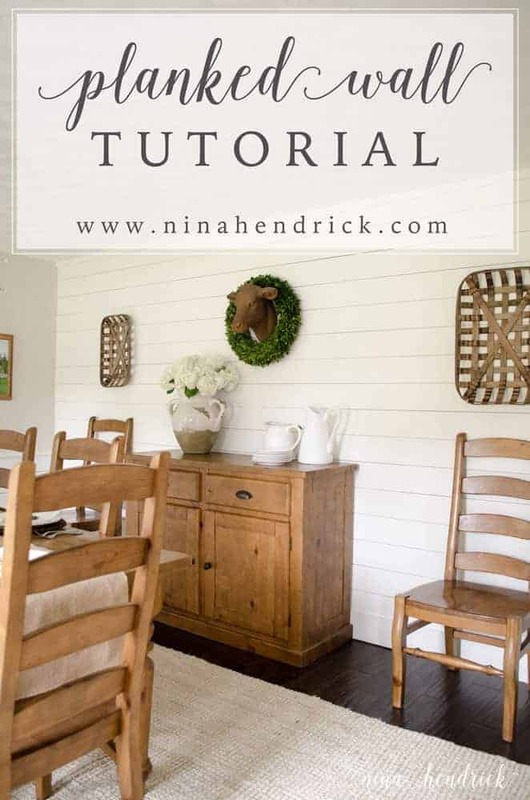 I personally didn’t want to call this a shiplap tutorial, because I feel like that’s misleading- I would hate for someone to think that they had shiplap, when in actuality it was not! Next we brought the plywood to Mack’s work, where he was able to cut them down using a panel saw. They can also do this at the home improvement store for you, but they were busy and we had access to one- so we chose to do it ourselves. Cutting down the plywood would make them easier to maneuver and run through our table and compound miter saws at home. I didn’t photograph this next step, but we ripped those pieces to 5 1/4″ using the table saw once we got home (which is the size of a standard 1×6″ shiplap, to further mimic the look). We started at the top of the wall, and made sure to level out the board. We knew we would be adding a piece of trim to cover whatever gap was left over at the top. We used a quarter as a spacer, which is a tip I had seen everywhere. We wanted to leave only a very tiny gap because we weren’t taking the time to prime the wall. If you have a nice white wall behind your planks and want a larger gap, I have heard you can use tile spacers as well! We made sure to stagger the seams so we didn’t have lines running up the walls. We definitely wanted variety. The tutorial didn’t really photograph well (we were doing this on a dark late afternoon last November, in a hurry, and I used my iPhone), but Mack had drawn pencil lines to mark the studs. He then used his nail gun to attach the boards to the wall. After that it was basically a lot of repetition. We made the cuts to length with the table saw on the ends, and made sure to use the leftover pieces to start the next row. It helped to add variation to the seams. Then came a lot of nail hole filling. Mack proposed this project shortly before Thanksgiving- so this was in the wee hours of the morning by the time we finished. Can you tell we were tired? 1:00 am sanding. Then we primed with latex-based primer. I was okay with knots showing through, but if you aren’t I would recommend Kilz original oil-based primer. For paint, I decided to go with an eggshell finish- I didn’t want any kind of reflection, so semi gloss or even satin didn’t seem to be the right fit. As I mentioned, we really had to buckle down and get this done before we hosted our families for Thanksgiving. I didn’t photograph the half wall treatment step-by-step (or, I guess you’d call it a 1/3 wall treatment, truly) but the overall process was the same. We started from the top again, so that the planks would be lined up in the corners, and went as close as we could get to the standard 32 inches for chair rail height. For the top rail, we used 1×2″ pine boards, and mitered them at 45 degrees at the windows and doorway. The baseboards are 1x6s. We also hid the gap at the top of the planked wall with a 1×2″ board. 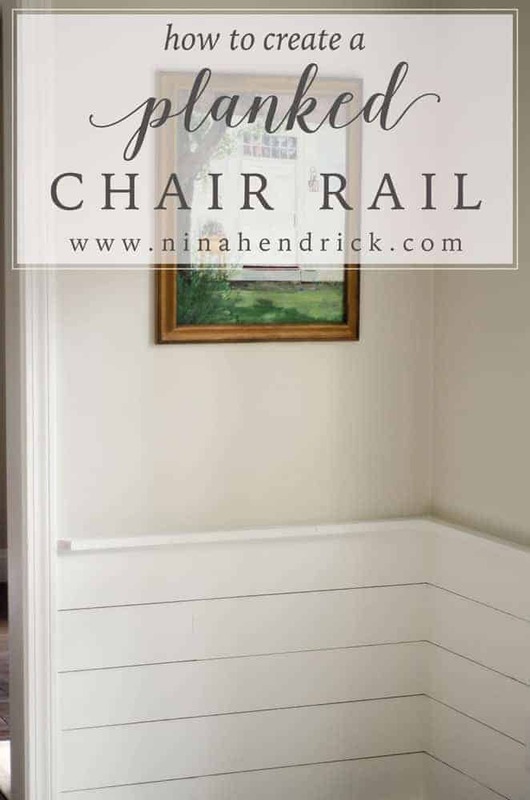 I love the look of the one large planked wall, along with the three chair rail walls. It gives it the perfect balance of farmhouse and traditional to fit the overall style of this home. 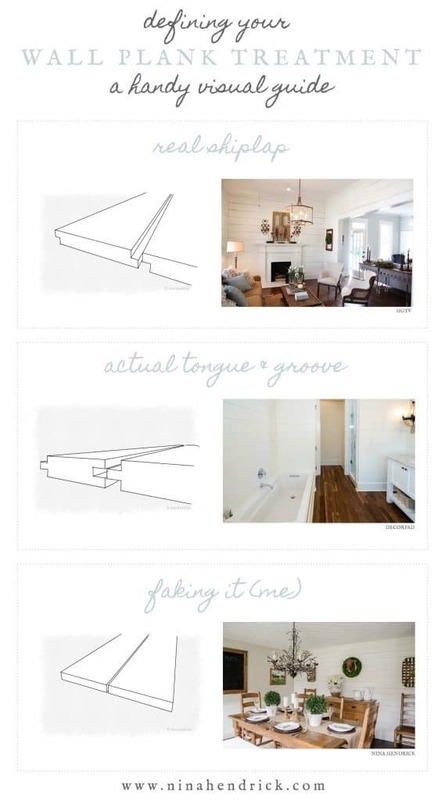 To finish up this room, I’d love to install tongue and groove on the ceiling. Does anyone have any experience with mixing this style of planks with tongue and groove? How does it look? I think that just about covers it. Please let me know in the comments if I missed any details, and I will make sure to answer! Why did you use ripped plywood instead of 1 x 6’s? It looks fantastic, and i may borrow this idea in a 100 year old house i am buying. Thanks for the terrific idea! Hi Donna! Thank you! We used the ripped plywood partially for cost, (for the area we were covering the 1x6s would have cost hundreds- possibly thousands!) and partially because we didn’t want to add bulk to the wall. Another factor was that the thin plywood is a little more rustic and textured, which I loved (you can also find it smooth, but I was going for a farmhouse look). Congrats on the home, that’s wonderful! Hello Nina, your finished plank walls look great! Can you comment on how you finished any wall that opens up into another room…in other words, an outside corner? I’m going to be adding some planked walls to our home and I’m undecided whether to add trim to the outside corner or not. Thank you! Hi Michelle, we didn’t actually have any outside corners- but we would wrap the corner with two mitered vertical pine 1x2s if we ever came across that issue! Hi Nina! Did you miter the ends of the planks where they meet the other planks at the inside corners of the room? Thanks! No, we just overlapped it in the corners! I was okay with a more rustic look. Some people miter and others use a filler strip of trim. What paint color is in your dining room for walls and planks? Hi Brandi! The walls are Benjamin Moore Edgecomb Gray lightened by 50% and the planks are BM Simply White. Can you tell me what you used at the top to finish off the trim? Thanks so much for the tutorial!! Can’t wait to try it at my home!! Hi, Mandy! We simply used a 1×2″ piece of pine trim and painted it white. How did you attach the 1×2” pine trim? I’m sorry, I should have been more specific in my previous comment. 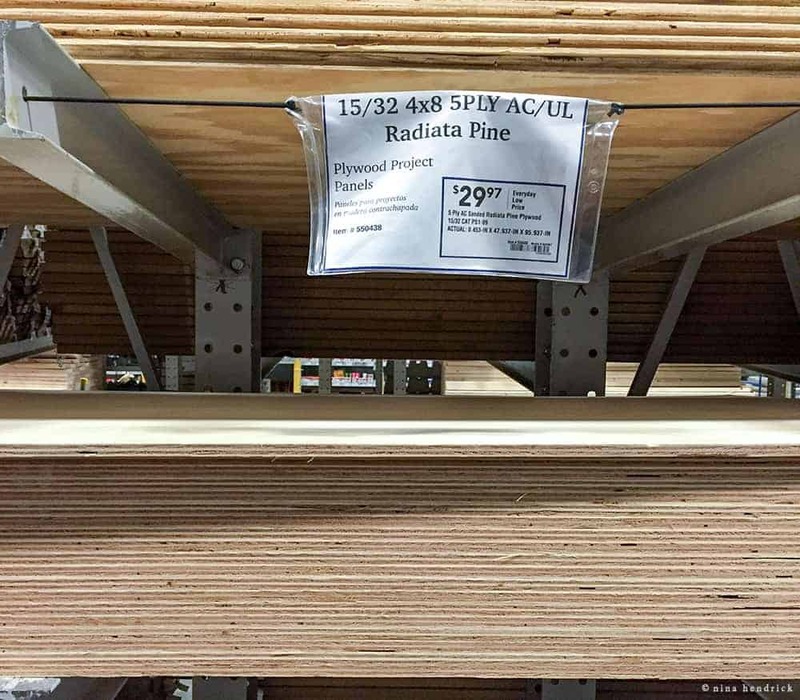 How is the 1×2” pine affixed to the wall? Hi, Annie! We used a nail gun with 2″ nails. You started at the top…was your ceiling height actually 8′? Also…what did you use for the baseboard? It appears that it stands out which is beautiful. Did you simply put the bvaseboard over your bottom piece? How do you think it would look if you painted tge wall & had a very thin but noticible gap between the boards? Our ceiling is not perfectly 8′, we hid the excess below the baseboard- which, yes is over the bottom piece. It’s a simple pine 1×6″. I think it would be pretty to leave more of a gap with the wall painted behind it. Beautiful work, Nina! Two questions: Did you do anything (like caulk, trim, etc.) to the space where the boards meet the end wall? And, did you install the 1×6 trim on the top board (like you did at the bottom), or above it? One more for fun… love the rug! Where did you get it? What’s its name? So pretty! We did not caulk where the boards meet the wall. The trim is on the top board! The rug can be found here (it’s the nuLoom Chunky Loop in Bleached 9×12’ish). Hi there! I’m curious if you painted in between the boards separately or just rolled over them? How did you stop paint from filling the gaps in between the wood? We just used a paint brush to paint the edges of the board and then went over everything with a roller. The previous paint color didn’t show through the gaps, so we didn’t have to go crazy. We did light coats of paint so that it wasn’t an issue of the paint filling in the gaps! Hi everything looks great… my question is why the gap in between the boards? To give them the look of authentic tongue-and-groove or shiplap boards.